Roman Reigns provides details on his leukemia diagnosis, WWE's Raw viewership, notes on King Kong Bundy, Joey Janela's return, card for New Japan's anniversary card & lots more. **This week’s edition of Rewind-A-Raw is available on the site with Wai Ting and I reviewing Raw from Philadelphia. We covered the angle to set up The Shield’s reunion and match for Fastlane, the closing angle involving Ronda Rousey attacking Becky Lynch, Torrie Wilson going into the Hall of Fame, the wide range of reactions to the promo from Triple H. Plus, we have the news of the day with an update on Asuka from the SmackDown house, the passing of King Kong Bundy and Luke Perry, AEW’s second show in July, and we take all your questions and feedback. **A reminder that anyone who is a member of the POST Wrestling Café, you are automatically entered each Monday in a draw to win an item from store.POSTwrestling.com. On last night’s show, we gave away one our brand-new SNAP BACK hats that you can now purchase from the POST Wrestling Store. **Tonight on the site, Wai Ting and I are back with Rewind-A-SmackDown with a full rundown of tonight’s show in Wilkes-Barre and the latest news from around the industry. Then, we have the Double Shot for members of the POST Wrestling Café. 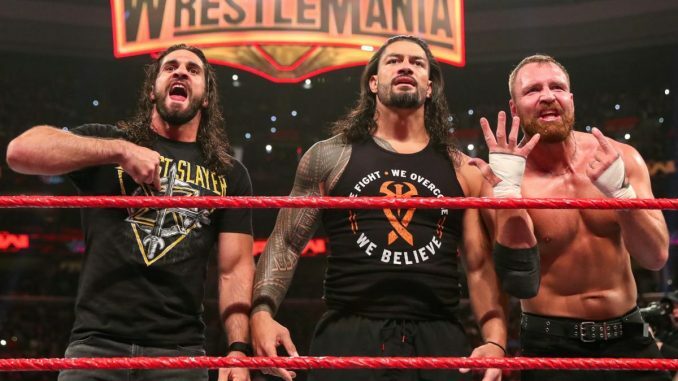 On tonight’s Double Shot, we will chat about the new Roman Reigns episode of WWE Chronicle, the WWE Untold special on ECW’s relaunch in 2006, Being the Elite, Total Bellas, and maybe some other quick reviews. This show drops every Wednesday morning for members of the Café. **The poll results are in and we will be reviewing WrestleMania 26 from 2010 on the next Rewind-A-Wai. That show will be released on Friday, March 15th for the members of the POST Wrestling Café. WrestleMania 26 won the poll with 35% of the votes and beat out WrestleMania 6 at 28%, WrestleMania 11 with 24% and WrestleMania 2 that received 13%. **The WWE Network premiered a new edition of Chronicle on Monday featuring Roman Reigns. The 30-minute special chronicled a three-day period from February 22nd through February 25th, which was the night of his return on Raw in Atlanta last week. Reigns spoke about the diagnosis last fall where he heard the news at a live event about an issue with a blood test. That Monday at Raw, he was informed of the findings and that his blood test showed an elevated white blood cell count. Reigns said he was diagnosed with CML (Chronic myelogenous leukemia) and caught it in the earlier stages with his treatment consisting of an oral form of chemotherapy through a pill. He added that there were side effects but stated it was a huge breakthrough that he could combat his disease through a pill. He added that he did not expect to return as soon as he did, noting he was 33 years old and wasn’t 22 when he was first diagnosed. **Not surprisingly, there has been a lot of coverage of King Kong Bundy’s passing. He was a well-remembered character with a great look and easily recognizable name. While his run with Hulk Hogan and headlining WrestleMania 2 are going to be the most-prominent moments of his career, a lot of focus has been placed upon his earlier work in Memphis, Mid-South, and Texas for World Class. Bundy also extended his career by becoming a stalwart on the independent scene throughout the late ’90s and well into the 2000s as he didn’t slow down until 2007. Despite being a character that many people associated with their childhood, he was not one of the legends that the WWE ever brought back or marketed. If you look at his last tweets, he was retweeting a lot of messages from fans requesting he enter the WWE Hall of Fame. While some will debate the merits of the WWE Hall of Fame, it’s become evident that it does mean a lot to these past performers. In the case of Vader, Jim Neidhart, and Chyna, they all died before they could be inducted, and each had expressed a desire to be included with Bundy appearing to have the same aspirations. Yes, there is an appearance fee and it leads to additional appearances through the WWE publicity, but it also allows some of these people that well beyond their active days in the ring to have one more night where there is a spotlight placed upon them. **Monday’s episode of Raw averaged 2,783,000 viewers on the USA Network. While their viewership was down almost 5% from last week, it was still Raw’s second-largest total this year. It was the third consecutive week with the first-hour topping 3 million viewers. The show dropped to 2,798,000 in the second hour and then down to 2,485,000 representing a 19% drop from the first hour. Last year’s show during this week averaged 3,030,000 viewers to compare year-over-year. **Asuka suffered an injury on Monday’s SmackDown house show in White Plains, New York. Asuka was wrestling Mandy Rose and landed badly with those in attendance concerned it was a neck injury. The match was called off and Asuka was assisted to the back by officials. Later in the night, Asuka provided an update stating that she was okay, and it was her back and not a concussion or a neck issue. We were informed that Asuka was scheduled to face Sony Deville on television tonight and there is no word if those plans have been altered. Asuka is also scheduled to defend the women’s title against Rose at Fastlane on Sunday. **The promo that Ronda Rousey cut in the final segment on Raw was supposed to go longer than it did. **Game Changer Wrestling put out a tremendous video to announce the return of Joey Janela at Spring Break III in April. Janela wrecked his left knee during a match with Psicosis last September that required surgery. The injury came off a relatively tame maneuver where he came off the top turnbuckle with a crossbody to the floor and instantly grabbed his knee after landing it. Spring Break is being split into two parts this year with a show on Friday, April 5th at 8 pm and another one Saturday night at Midnight at the White Eagle Hall in Jersey City. Both events sold out immediately. Based off the angle on Raw, it would appear they will be adding a three-way for the Raw tag titles with The Revival vs. Aleister Black and Ricochet vs. Chad Gable and Bobby Roode, which is a great match on paper. **The WWE’s Extreme Rules pay-per-view will take place Sunday, July 14th from the Wells Fargo Center in Philadelphia. **Total Bellas averaged 411,000 viewers on Sunday night, which was their second-lowest number of the season. There are three more episodes this season with the season finale on March 24th. **It was announced on Raw that Michael Che and Colin Jost will be special correspondents at WrestleMania in April. The segments involving the two on Monday were dreadful and that comes from someone who is a huge fan of these two on Saturday Night Live. The upside of their involvement is if the WWE receives a presence on SNL going into WrestleMania with mentions of the show or cameos from any of the talent. It would make a lot of sense for the cross-promotion involving the two entities. **The WWE is promoting a face-to-face confrontation between Triple H and Batista for next Monday’s episode of Raw in Pittsburgh. They will be in the same building where Batista returned for the Royal Rumble in 2014 and was booed vociferously when he won the match, which didn’t include Daniel Bryan. **MLW has announced that Tom Lawlor will defend the MLW title against Jimmy Havoc in a New York City Street Fight on Thursday, April 4th. The “Rise of the Renegades” television taping will take place during WrestleMania week with back-to-back nights scheduled at the Melrose Ballroom on Thursday and Friday that week. **Impact Wrestling has announced that premium seating for the April 4th United We Stand event is sold out with general admission tickets still available. The card takes place from Rahway, New Jersey and is shaping up to be a strong card. It will be available to stream that night through Fite TV. **Dana Warrior put up a blog post describing her passion for writing and alluding to her role within WWE following reports over the past week. Warrior was scheduled to be at Raw and SmackDown this week. **The WWE has announced a distribution deal with SBS Belgium to air one-hour versions of Raw and SmackDown on ZES in the country. Raw will air in a one-hour slot on Wednesdays at 10:30 pm followed by SmackDown at 11:30 pm. The shows will also be available through their on-demand platform. The shows will be broadcast in English and contain Dutch-Flemish subtitles. **The WWE is launching a version of WWE Now for India, which will be hosted by Gaelyn Mendonca. The show will be presented in Hindi and made available on WWE India’s social media channels. George Barrios recently spoke about the WWE’s push for localized content in global markets and cited this method of using local hosts within the region as a priority for them. **DEFY Wrestling has a card this Friday in Seattle, Washington at Washington Hall at 8 pm. The card will feature Ultimo Dragon taking on Matt Cross, Yoshihiro Tajiri vs. Super Crazy, Artemis Spencer vs. Ethan HD for the DEFY championship, Shane Strickland vs. Darby Allin, Royce Isaacs & Jorel Nelson vs. Eli Surge & Judas Icarus for the tag titles, and more. The event is a 21 and over show. **USA Championship Wrestling is presenting an Eddie Gilbert Tribute Show this Saturday at the Oman Arena in Jackson, Tennessee. In the main event, Jerry Lawler teams with Doug Gilbert to take on Matt Riviera and Tommy Rich. The card will also feature Dr. Tom Prichard taking on Christian James and appearances from Bill Dundee, Phil Hickerson, and others. **The WWE stock closed at $83.15 on Tuesday. **The UFC 235 preliminary card on ESPN did another strong number with 1,480,000 viewers on Saturday going into the pay-per-view. They had a good lead-in from the college basketball game on the network that did 1,692,000 viewers. The prelims were headlined by Zabit Magomedsharipov defeating Jeremy Stephens by unanimous decision and was a strong lineup for fights for the free broadcast. To compare, the UFC 234 prelims last month did 1,339,000 viewers and that came with an enormous lead-in from a game between Duke and Virginia that did 3,318,000 viewers. So, I consider Saturday’s number way more impressive given the smaller lead-in and doing 10.5% higher. Monday’s episode of Raw built towards the reunion of The Shield and the announcement of their match for this Sunday’s Fastlane event, Triple H’s reaction to Dave Batista after his attack on Richard Fliehr, King Kong Bundy passes away, Arn Anderson firing details and Torrie Wilson joins the WWE Hall of Fame. John Pollock is joined by Phil Chertok to review UFC 235 featuring Jon Jones vs. Anthony Smith for the light heavyweight title and Tyron Woodley vs. Kamaru Usman for the welterweight title. John Pollock & WH Park review the Giant Baba Memorial card, predictions for the entire New Japan Cup, Jay White wins IWGP title, PAC vs. Kzy, Takashi Iizuka’s retirement, Champion Carnival blocks & more. John Pollock and Wai Ting look back at WWF Raw is War and WCW Monday Nitro from July 13, 1998, in this special double review. Raw continued the mystery of whether The Undertaker was in CAHOOTS with his brother Kane ahead of a scheduled tag team match with Steve Austin, while Nitro brought us the fallout from Goldberg’s first WCW title win the week prior. Braden Herrington is joined by POST Wrestling’s John Pollock to review this week’s edition of WWE NXT including a huge match from Keith Lee vs. Dominik Dijakovic, Shayna Baszler vs. Mia Yim, and DIY are “officially” back together.